Well, it’s finally upon us, the much anticipated Federations Cup Finals. We battle Dolphins at the Teslim Balogun Stadium tomorrow as we seek to end our season on a high. Only a week ago, we watched Pillars crowned Champions in Aba and it is this same team, Dolphins that hurt our title bid. A 1-1 draw with them at the Liberation Stadium amid a host of missed chances for us saw us concede the title again to Pillars. Well, this is a Cup final game and haven seen off the oppositions lined up before us, we have just one game to claim our only trophy this season. “Well, preparations are in full swing. It is going well. We arrived Lagos yesterday evening and we are ready, we have been having meetings and everyone wants to make history tomorrow. As far as we are concerned, tomorrow’s game is must win and by the grace of God we will win”. On the Pain of losing the League title he said, “It is unfortunate at we did not win the League title but that has come and gone. The Federations Cup is here now and we want to win it. We want to make our fans proud and we will do our best”. For one who has spent 7 years at the club, he understands what the Enyimba tradition stands for, he knows what it means to win with the club and he understands the expectations from the fans. Rasheed has been out for sometime now with a knee injury but he says he is fit for the finals. Let’s hope Kadiri Ikhana thinks so too. 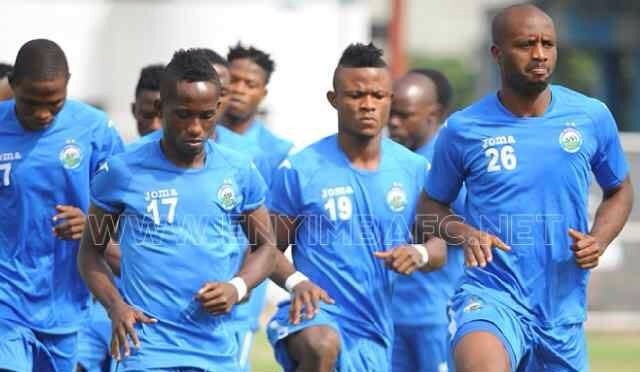 The best striker in the world, Mfon Udoh also lent his voice to how ready they are ahead of the game. “Tomorrow’s game means a lot to us both as individuals and as a team. It is our chance to get a cup this season, so we will do all we can to win the game”. Mfon’s self drive and motivation is one of the most inspiring I have seen since my interactions with players. He not only addresses the media excellently but he puts efforts in games commensurable with all the talk he gives. He’s a fighter, a superb athlete and one whose performances can cheer up teammates who get lost in the course of games. Let’s trust that he’s on his A game as usual tomorrow. Conclusively, today is Chinedu Udoji’s birthday. Our skipper has led well this season and even though his game can be devoid of some occasional rash challenges, you cannot fault his commitment to defending the Enyimba cause. Happy Birthday Skippo. Many more years. Expected line up for tomorrow shouldn’t be different from what we have seen in recent times. Baring an injury we are unaware of, I’ll like to see- Femi Thomas, Ugwu Uwadiegwu, Emma Anyanwu, Chinedu Udoji, Bala Zakka. Rasheed Olabiyi, Nzube Anaezemba, Sokari Kingsley, Mfon Udoh, Chimezie Amanfor and Emeka Nwanna. I think the manager will prefer Abalogu to Amanfor and we might see that. He knows what eleven will get him the result and to be honest, Andrew has not been having the best of play recently but then, we employed him to make such decisions. The likes of Abdulrahman Bashri or Meshack Chukwubuikem could come in for Emeka Nwanna who we have come to become so so dependent on in recent times. Chinonso Okonkwo of course is suspended. One wonders just how much Nwanna’s tiring old legs can offer in the near future but then again, he’s one of the best strikers we currently have and he can lead the line tomorrow. We have what it takes to successfully defend this trophy but it will require us being at our exceptional best to do so. We can and I believe we will, So let’s do it. PS. If you are not in Lagos, you can follow the game as it is live on Super Sports. Kick off time is 4pm. I believe. Previous postFirst Preview Enyimba vs Dolphins Federations Cup Finals. Next postAll Hail, the 2014 Federations Cup Champions. I do hope we come out victorious. Though Dolphins have never lost in the final, it hasnt been the same team since the last time they won it. Whereas we, we’ve had consistency with our squad which gives us an edge.